CADAC is exhibiting at InfoComm for the first time as Cadac Audio Ltd US & Canada, its new North American sales and distribution arm, under the direction of general manager Paul Morini. The company will be focusing attention on its MegaCOMMS System Network with the introduction of three key infrastructural network components – the CDC MC Router, CDC MC MADI Network Bridge and CDC MC Dante Network Bridge. MegaCOMMS extends CADAC audio performance across scalable digital audio networks of up to 3072 channels of 96kHz/24-bit audio, comprising multiple CDC I/O stage boxes and consoles. The extensive latency management system automatically manages all internal routing and associated processing latency, providing time-aligned, phase-coherent transmission with sub-0.4 millisecond latency, from analogue inputs on stage to analogue outputs on stage. The 2U CDC MC Router is the hub of the MegaCOMMS System Network, with a single router supporting 128 channels of bi-directional 96kHz/24-bit audio. The router currently allows up to four MegaCOMMS consoles to be linked to up to eight MegaCOMMS I/O stage boxes or audio network bridges within the same audio network, all on 150 meter (492 feet) runs from the CDC MC Router. It can also be configured to allow a redundant console to run in parallel with the live console. Future upgrades will increase the power and expand the flexibility of this unit to take further advantage of the capacity of the MegaCOMMS network. 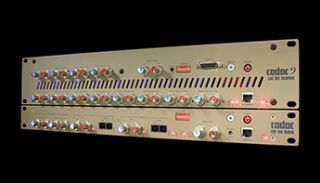 Commenting on the power of the MegaCOMMS System Network, brand development manager Richard Ferriday said, “MegaCOMMS networks allow connection of multiple, CDC eight and CDC four, consoles and I/O stage boxes, or third party consoles, sources and audio networks, via the MADI bridge. With all audio samples synchronized before summing, there is absolute phase coherency at all outputs and negligible aggregated latency. Together with full 96kHz / 24-bit audio, this offers a major performance improvement in terms of sound quality, along with a network capability of up to 3072 channels.